Hubert de Givenchy, a French designer whose fashions influenced haute couture in the 1950s and 1960s and transformed his close friend, actress Audrey Hepburn, into a style legend, died March 10 at a hospital in Paris. He was 91. His nephew, James de Givenchy, a New York-based jewelry designer, confirmed the death but did not provide a specific cause. For more than four decades, Mr. Givenchy bridged the American and Parisian fashion worlds, designing effortlessly chic clothes that adorned European royalty and Hollywood stars. He clothed Greta Garbo, Marlene Dietrich, Grace Kelly, Lauren Bacall, Elizabeth Taylor and some of the world’s most fashionable women, including first lady Jacqueline Kennedy and the socialites Rachel “Bunny” Mellon and Catherine “Deeda” Blair. The precociously talented, darkly handsome 6-foot-6 designer was only 25 when he opened his atelier in Paris in 1952. His debut collection was one of the earliest ready-to-wear high-end fashion lines. Mr. Givenchy thought mix-and-match separates, including interchangeable dresses, light skirts and chic tops, offered women more versatility with their look and choices in creating their own style. Operating on a shoestring budget, he created a handful of styles out of inexpensive men’s shirting material for his first collection and asked customers to select their preferred fabric. 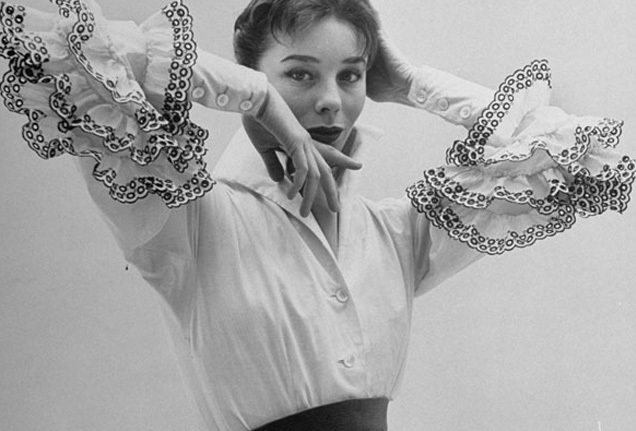 The crisp, embroidered, full-ruffled “Bettina” blouse (named in honor of the late model Bettina Graziani) was an instant hit. By the end of the first day of business, the store reportedly rang up 7 million francs (about $14,000 in today’s dollars). Mr. Givenchy’s fashioning of and relationship with Hepburn was often regarded as his broader cultural breakthrough. The couturier first met Hepburn in 1953 after she had been cast in writer-director Billy Wilder’s romantic comedy “Sabrina.” She played a Long Island chauffeur’s tomboy daughter who studies abroad in Paris and returns a chic, sophisticated woman. Hepburn thought it would be fitting for her character to wear authentic Parisian couture. When told he had the opportunity to costume Hepburn, Mr. Givenchy was under the impression it was a different famous Hepburn — Katharine Hepburn. Though Audrey Hepburn had received acclaim in the United States for her starring role in “Roman Holiday,” which would eventually earn her an Oscar, the film had not yet been released overseas. At the time, the waifish actress was still a relatively unknown star in Europe. Mr. Givenchy was shocked when the doe-eyed, gamin beauty walked into his studio. Scrambling to complete his next collection, he told Hepburn he was too busy to design original pieces for her but that she could select items from his previous season’s collection, including the belted ivory dress she wore to the 1954 Academy Awards. “She gave a life to the clothes — she had a way of installing herself in them that I have seen in no one else since, except maybe the model Dalma,” Mr. Givenchy told Vanity Fair in 1995. “Sabrina” won the Oscar for costume design, although head designer Edith Head failed to acknowledge Mr. Givenchy’s contributions during her acceptance speech. According to Head’s biographer, David Chierichetti, Head banked on the fact Mr. Givenchy was “such a gentleman he would not make a fuss.” He did not. Hepburn was furious. From that point on, she insisted Mr. Givenchy costume her in subsequent films including “Funny Face” (1957), “Breakfast at Tiffany’s” (1961) and “Charade” (1963). She became his greatest fashion ambassador on screen and off. Although Mr. Givenchy did not invent the little black dress, he undoubtedly crafted one of the best remembered: the quintessential black satin gown worn by Hepburn in “Breakfast at Tiffany’s.” Hepburn’s sleeveless sheath — with its striking bateau neckline; subtle, cinched waist; and crescent-shaped cutouts in back — was an influential fashion statement. Paired with elbow-length silk gloves, oversize glasses and a necklace of pearls, the look gained worldwide renown. “The little black dress is the hardest thing to realize,” Mr. Givenchy once told the Independent newspaper, “because you must keep it simple.” In 2006, the dress sold for more than $900,000 at a Christie’s auction in London, one of the highest prices paid for a film costume. When Hepburn was diagnosed with terminal colon cancer, he was the one who arranged her travel to Switzerland on a private plane owned by Mellon, the Listerine heiress who had married financier Paul Mellon. “Thank you for the magic carpet,” the screen star later told her friend. Hubert James Marcel Taffin de Givenchy was born in Beauvais, France, on Feb. 21, 1927, to a prosperous family of noble lineage. He was about 2 when his father died, and he was raised by his mother and maternal grandparents. In defiance of his family's wish that he pursue law, he attended the National School of Fine Arts in Paris. He later apprenticed under designers including Elsa Schiaparelli before opening his own workshop. Mr. Givenchy also met and befriended Cristóbal Balenciaga, a Spanish-born designer he had admired since childhood. Balenciaga mentored the younger couturier, even sharing his clients and seamstresses after he closed his fashion house in 1968. After his retirement, Balenciaga encouraged many loyal clients to switch their allegiances to Mr. Givenchy, going as far as to walk Bunny Mellon over, hand in hand, across the street to his mentee’s salon on Avenue George V.
Mr. Givenchy fashioned Mellon’s entire wardrobe, from her lingerie to her gardening smocks, and she, in turn, helped design his gardens. The two shared weekly phone calls, Mr. Givenchy told the Financial Times, until her death in 2014 at 103. Meanwhile, Mr. Givenchy’s collections changed with the times, from feminine frocks in the 1950s to higher hemlines in the 1960s and debonair tailored suits for men in the 1970s and 1980s. His whimsical romanticism and simple, elegant design aesthetic remained intact. Over time, Mr. Givenchy’s label expanded his men’s fashion line, as well as an accessory, sports, perfume, jewelry, furniture and makeup division. In 1988, Mr. Givenchy sold his design label to the French luxury goods conglomerate LVMH for $46 million. He continued to pour out collections six times a year until his official — somewhat forced — retirement in 1995. LVMH executives had dramatically downsized his responsibilities and voiced their desire to bring in new talent. His successor was the far more radical British designer John Galliano. The fashion house, which still bears Mr. Givenchy’s name, has since been headed by Alexander McQueen, Julien Macdonald and, most recently, Clare Waight Keller. “There is no continuity to any of the DNA of what Givenchy was doing,” Steele said. At Mr. Givenchy’s final couture show in 1995, peers including designer Valentino, Yves Saint Laurent, Christian Lacroix and Oscar de la Renta paid their respects from the front row. Mr. Givenchy, dressed in his signature white smock, wept when Hepburn’s son Sean Ferrer presented him with a bouquet of white roses taken from the 60 bushes he gave to Hepburn on her 60th birthday. In his later years, Mr. Givenchy led the restoration of Louis XIV’s vegetable gardens at Versailles, served as president of Christie’s France, and collected fine art, furniture and sculptures. He received the Council of Fashion Designers award for lifetime achievement in 1996. Survivors include his longtime companion, couture designer Philippe Venet, of Paris.